There was very little current in the river so we made it to the Old Hickory lock by 9:30AM. There was a short wait while the lock was emptied, and we were underway at 10:00AM. We made a short stop at Anchor High Marina to get 120 gallons of diesel at $3.059 and to check out the transient docking facilities. There is one dock with power that will hope to use on our way back. The dockmaster said that they get very few transients at Anchor High. It has a great restaurant that we want to revisit. This was the hottest day yet, with a relentless sun shining on the boat. We ran the genset from Anchor High to Cedar Creek and then switched to shore power. Since the water is 85 degrees the marine airs have to work even harder. The best we could do during the afternoon was 83 in the salon and 79 in the aft cabin. There are two trawlers at the dock, both are live aboards that have done the Great Loop. We had cocktails with them tonight. They have been here a month or two and have totally insulated their cabins with reflective foam on all the windows and canvas “awnings” out side. It is like being in a cave with the lights on all the time. However, it was nice and cool and we enjoyed meeting them. Tomorrow is the long day 80 miles to Defeated Creek on Cordell Hull Lake. The lock master is expecting us between 3 and 4 pm. 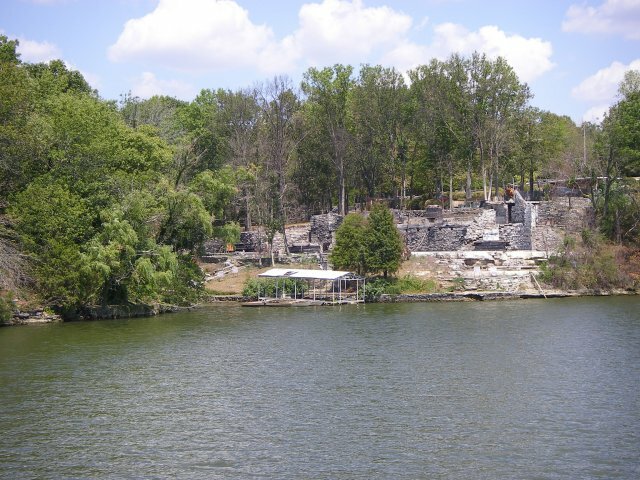 The photo shows the ruins of Johnny Cash's home on Old Hickory Lake. We had passed it 4 times before but never noticed it. Sadly, today it was easy to find.